St Mary’s. This Saxon church is our regular church of worship for villagers. The long and short stone corner quoins, the impost moulding of the present Victorian chancel arch and the tall narrow nave point to the Saxon foundation, but the church has been subject to much restoration. The tie-beamed and wind braced roof is 16th century while the pulpit, balustered font and panelled gallery are Georgian. More recent additions are the beautiful memorial panes of glass etched by both Laurence Whistler and his son Simon, the renowned glass artists, who each lived in the village for some years, have been installed in the south widow of the chancel. Sadly some of you may know that St Mary’ Church has had to be closed again as some of the new plaster ceiling fell down. The good news is that we will be open from September for the first service on the 2nd. We look forward to welcoming as many as possible to the Church on Saturday 8th September for Ride + Stride. (further details from Charles Graham Ride + Stride, Administrator, 01672 514301) drinks provided depending on the weather. An advance notice is that our Harvest Festival will be an all age service on Sunday 7th October at 9.30am followed by breakfast, we do hope to see lots of people especially families. All Saints. There are 3 services annually and the Music For Awhile summer concerts in this ancient church set in the meadows between our two villages. All Saints' roof Appeal. In the summer of 2015 half the lead roof from All Saints’ was stolen. 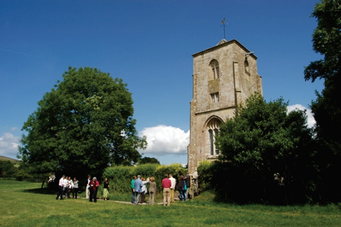 Music for Awhile has been working with the Churches Conservation Trust (CCT) to investigate both medium - and long -term solutions to this problem. 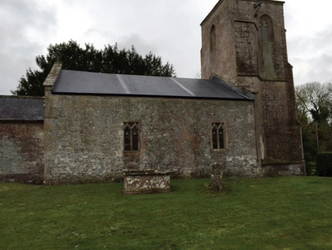 Whilst grant sources for the major work are being researched, the CCT has agreed that it is essential to protect the church from further water damage and possible irreparable decay. 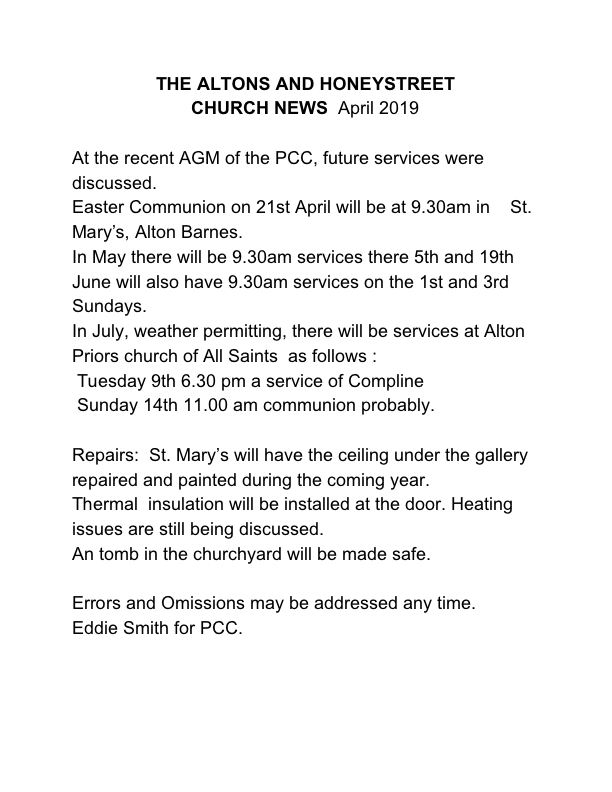 An interim measure has been applied which will protect the church for up to a decade, while significant funds can be raised towards a permanent solution. A sophisticated rubberoid roof membrane has been laid over the damaged roof, which is barely noticeable from the ground, preserving the beauty of our historic building. The Chapelry of Priors is mentioned during the time of Alfred the Great. Lords of the Manor from the 13th to 17th Century at Alton Priors were the Buttons who lived at the nearby Priory. In the churchyard is the 1,700 year old yew tree. Other points of interest at All Saints are the two walled-up doors on the North and South side, the former with a surmounting consecration cross, the scratch sundial on the tower and the eccentric position of the chancel with respect to the main body of the church. Despite the acquisition of a paten of 1638, the past importance of the chapel, exemplified by the perpendicular tower, the twelth-century chancel arch with pelletted frieze imposts and wide nave declined, and its former role in the rural community fell to the tiny sister church of St Mary, Alton Barnes. All Saints is maintained by The Churches Conservation Trust.